When I saw these matte golden notebooks as a double pack in the crafts shop last week I had to have them. They are bound with a thread instead of metal clips, beautifully, and you can never have enough notebooks! Today I made a gift for a hobby cook with decorating one of them with a very detailed design (an altered graphic from a vector design collection) from black glossy vinyl cut with the Silhouette Cameo. It was not an easy job, because the lines of the text are very thin. But in the end it worked and I love the result. The vivid contrast between the high glossy vinyl and the shimmering gold is hard to show in a static photo. 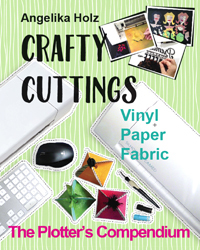 You need a blanc notebook, a piece of vinyl and matching transfer tape and of course your cutting machine. First you prepare your design in Silhouette Studio. Watch your cut lines the motifs not to be too thin and that all overlapping parts are weld. Put your vinyl on the cutting mat. For glossy vinyl I use cotton gloves to avoid having finger prints on the material. I used blade length 1 (I never trust blade length 1, but indeed it worked) and thickness 10. If you are not sure make a test cut. Then weed all the parts around your design, that have to go off with a hook or pick. This took the most time. Carefully put the transfer tape onto the right side of, on top of your vinyl. Then remove the backside of the vinyl. Then place your design onto the notebook and fix it by rubbing over the transfer tape. You can also use a scrape, but I personally prefer to use my hands for this. You can rub again with a cloth over the finished book to make sure all parts are sticking well. Have fun to make your own personalized notebooks!